Opening: February, Friday 17th at 6.00 p.m., at Carinarnica – bivak urbane kulture, Erjavčeva 53, 5000 Nova Gorica, Slovenia (Carinarnica is situated on the border between Italy and Slovenia). Opening hours: from 17th February 2017 to 3rd March 2017; from Monday to Friday, from 02:00 p.m. to 05:00 p.m. Free entry. IoDeposito Ngo, with patronage of UNESCO, unveils on Friday 17th February at ore 6.00 p.m. the exhibition NO WORDS – NO WAR / A Poli-focal interactive installation by Natalia Tikhonova, at Carinarnica -bivak urbane kulture. In the evocative location in Nova Gorica, a new laboratory and meeting point of urban cultures, it will be accommodated the series of the Russian artist's optical installations, until the 3rd March 2017: from Monday to Friday, from 02:00 p.m. to 05:00 p.m. Tikhonova's works of art are focused on the return of the war's human and sensory dimension. Thanks to an innovative employment of historical photos and chromatic filters, the artist could reach meanings and feelings that sometimes have been pushed aside in historical books and essays: wars were made by humans against humans and so, among dates and reports of conquests, there are death, dismay, incredulity above all. 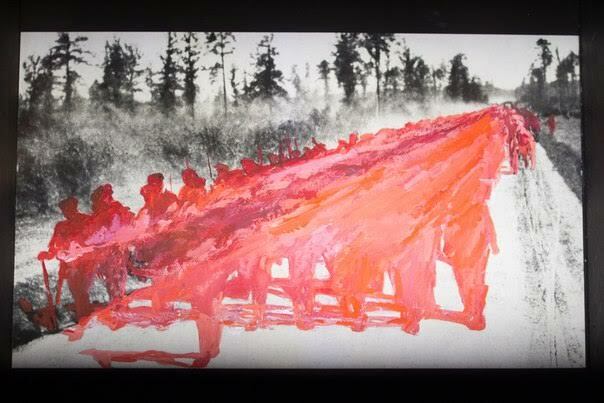 The fil-rouge of the Tikhonova's project is that our mind can condition the perception of war until making it something distant, ephemeral and non-existent. Memory and imagination in fact are able to erase not only certain details, but also to make us forget the human presence and components of war, offering an illusory image, erasing the drama of death and leaving only a memory of a desert natural scenography. 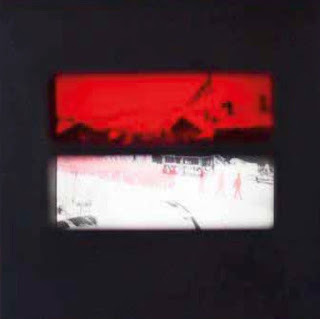 This reaction, nearly to distance oneself from the harsh reality, is revealed in the series of optical installations by Nathalia Tikhonova with a game of filters that, among the blacks and greys of ancient photos, makes appear and disappear bloody and evanescent figures of soldiers: the legacy of war are read therefore through the colours, made of bright red (which presage) and dense gray (which bewail). The descriptive language of chromaticism needs no other explanations because is able itself to tell about who has lost everything, even life, in the Russian front (which becomes a universal symbol). In this way, the artist invites the viewer to get in touch with the war's experience through the observation from different perspectives. Carinarnica, which was inaugurated last year by Društvo humanistov goriške Carinarnica, amplifies this artistic experience because is a very significant location: the border house on the border which split the city of Gorizia in two after the Second World War. The street where is nowadays situated the urban cultural centre is half Italian (San Gabriele street, Gorizia) and half Slovenian (Erjavčeva ulica, Nova Gorica) and so, it brings in itself a huge symbolic meaning. The exhibition belongs to the third edition of the diffuse artistic and cultural Festival B#SIDE WAR, which is promoted by IoDeposito through numerous Italian and international events such as exhibitions, conferences and research project (www.bsidewar.org).